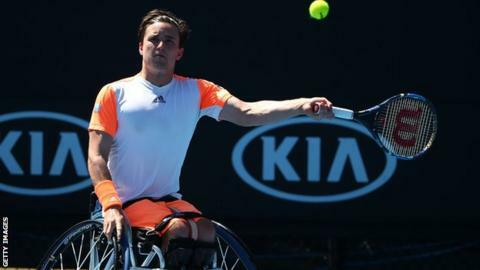 Defending champion and top seed Gordon Reid went out of the wheelchair singles at the Australian Open with a three-set first-round defeat by Joachim Gerard. The Briton was beaten 7-5 5-7 7-5 by Belgium's world number three, who had lost to the Scot in last year's final. Another British player, Alfie Hewett, lost 6-3 3-6 6-3 to French second seed Stephane Houdet. But there were wins for Andy Lapthorne in the quad division and Lucy Shuker in the women's event. Lapthorne, who won singles silver and doubles bronze at the Rio Paralympics, beat American second seed David Wagner 6-2 6-2 in his first round-robin match. He will face top seed and Paralympic champion Dylan Alcott of Australia in his second match on Thursday. Shuker, the world number nine, reached the women's semi-finals by coming from 2-0 down in the second set to beat Marjolein Buis, the world number four, 6-2 6-3. She will now play second seed Yui Kamiji on Thursday. Gerard had defeated Reid in another three-set encounter in their last meeting - December's final of the NEC Wheelchair Tennis Masters in London. Reid's Australian Open campaign is not over as he will partner Gerard in the wheelchair doubles. They will face Maikel Scheffers of the Netherlands and Australia's Ben Weekes in the semi-finals on Thursday.